I had no soup plans for the week. Our store has been closed for over a week and it’s taking so much energy to get back into things. But when I got to work on Tuesday there was a message on the machine from a local food magazine. They want me to come in tomorrow for a photo-shoot! 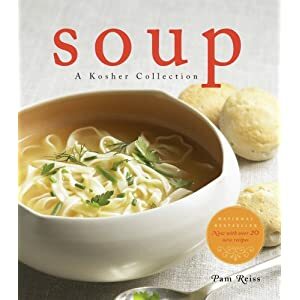 Their February issue is focusing on soup – I wrote a soup cookbook – there you go. All I need to do is get to their offices in the morning, ready for pictures, with some soup already prepared. Easy enough. They requested borscht – so I made a batch from the recipe in my cookbook. Borscht can be made in so many different ways. When I make it at work, I usually go for more of a sweet and sour tone. This version is very subtle in it’s sweet and sour flavour. You could always add some sugar or lemon juice to kick that up. Feel free to add some cabbage – and garnishing with sour cream is encouraged. Another version, which I love, is meat borscht. Start by bringing some stewing beef up to a low boil in the 8 cups (2 L) of water, skimming off any residue and simmering approximately half an hour – until the meat is cooked and tender. 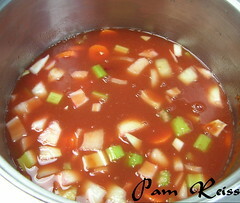 Then add the vegetables and follow the recipe. The meat will be sweet and tender. 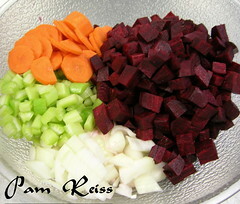 Place the beets, carrot, onion, celery, tomatoes and water in a soup pot. Cover and bring to a boil over high heat. 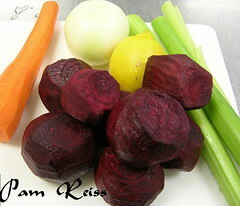 Reduce the heat to medium, and simmer for 45 minutes, or until the beets are fork-tender. Add the salt, pepper, granulated sugar and lemon juice. The seasoning may need adjusting, but it should have a subtle sweet-and-sour flavour. yum. is this one from your book? i like the vegetarian ones, too. I like vegetarian, but I do think ones with meat are my favorite (what ISN’T good with some flanken added?). I usually add some cabbage too – and some sour salt… but it’s all good. 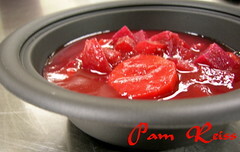 Have you ever made a cold borscht? I love it sometimes too! I generally prefer borscht hot – but I make a chilled pureed soup with roasted beats and a splash of balsamic that I like.